May 29, 2018 - Committed to understanding the museum landscape and improving diversity in the arts, the Foundation partnered with the Association of Art Museum Directors (AAMD), the American Alliance of Museums (AAM), and Ithaka S+R to conduct a groundbreaking survey of art museums nationwide on the diversity of their employees. In this short video, Mellon Foundation Executive Vice President Mariët Westermann and Ford Foundation President Darren Walker discuss why Mellon’s Art Museum Demographic Survey was critical to the development of curatorial and other diversity initiatives in the museum world. The survey illustrated the scale of the problem we face and provided valuable metrics against which we can measure change. As ideas about how to structure a new program aimed at diversifying curatorial staff across the nation were percolating, Westermann realized that measuring the success of the curatorial diversity program required hard data to show the extent of the problem. In 2015, the Mellon Foundation partnered with the Association of Art Museum Directors (AAMD), the American Alliance of Museums (AAM), and Ithaka S+R to survey art museums on the diversity of their employees. The demographic figures from the survey pertain to the responses from 181 AAMD museums. The results revealed that people who identify as “non-Hispanic white” hold 84 percent of the leadership, curatorial, conservation, and programming positions that perform the key mission-oriented educational, intellectual, and programmatic work of museums. Non-white employees are concentrated in back-of-the-house jobs like administration, human resources, security, and facility maintenance. These positions have little impact on how art is exhibited, collected, conserved, or even discussed in public or educational programs. 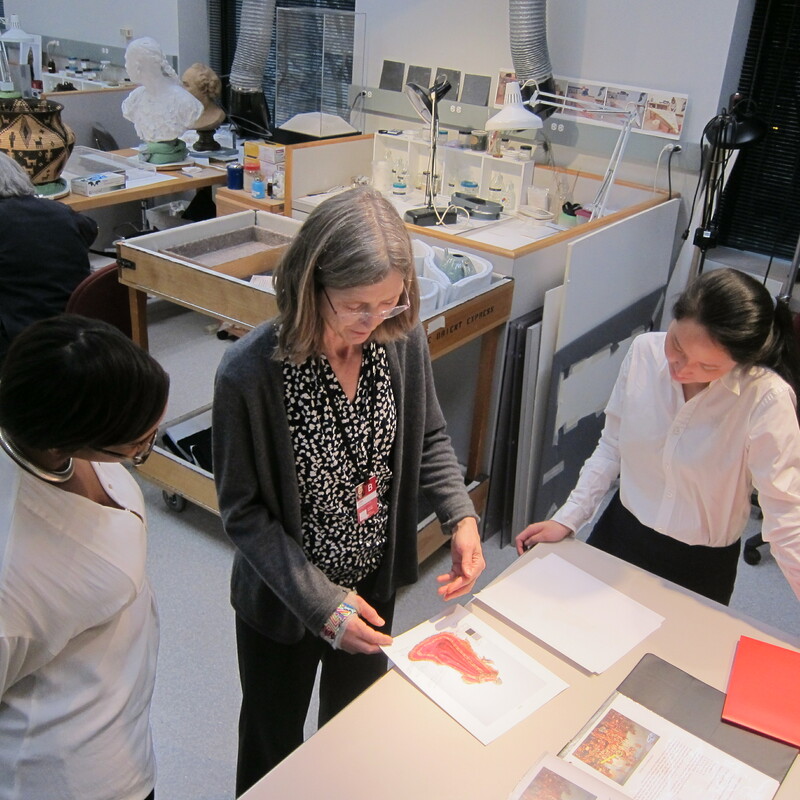 Art Institute of Chicago’s Mellon Undergraduate Curatorial Fellows, Sheridan Tucker and Sarah Molina, meet with objects conservator, Emily Heye, to view and discuss the treatment of the Neapolitan Creche. Photo courtesy of the Arts Institute of Chicago. Many municipalities are beginning to address diversity in arts institutions. In 2016, the New York City Department of Cultural Affairs revealed the results of its own survey of diversity in city arts organizations, employing the same methodology used by the Mellon Foundation. In 2015, the Los Angeles County Board of Supervisors passed a motion calling on the LA County Arts Commission to establish a task force to work with arts institutions to identify best practices to ensure cultural equity. Two years later, county supervisors advanced a proposal with specific recommendations to increase ethnic, socio-economic, and gender diversity in both the staffing and audiences of arts organizations. The Mellon Foundation is already committed to measuring whether the museum landscape has improved or worsened in the last five years. This type of impact research and follow-through leaves Cole feeling optimistic about the Foundation’s curatorial diversity program. “It’s a commitment to face a problem with a plan that includes action,” Cole said. The Mellon Undergraduate Curatorial Fellowship intends to make the country’s art museums more representative of our nation's growing ethnic diversity.